Guess who is the big 7 years old today? 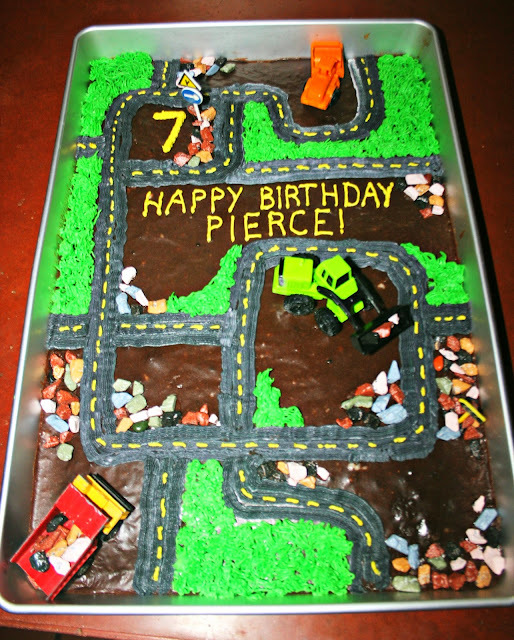 Pierce loves roads, and requested a 'road cake'. He is slightly obsessed with roads and maps. I made my chocolate sheet cake, and went from there, using a buttercream frosting to do the roads and grass. He was thrilled with his construction style cake, full of roads for driving, and chocolate rocks (which I found at Dollar Tree). May year 7 be full of fun and adventure for him! I am kind of the same way, I like to look for the old original wagon roads that often parallel the current roads. A branch of the Carolina Trail goes near our house and I can see parts of it on the way to work. There is a section in waid park if you guys get out there, they had a sign up at one time. Here's wishing a happy birthday to Pierce! Wow, 7 years went by fast. What a handsome fellow he is. May his life be filled with many happy adventures. That's a fun cake and you did a great job with it. I bet he did love it, and Happy Birthday to him! Happy Birthday to Pierce! What a great cake you built, he is so lucky to have such creative Mom. Fabulous photos and that smile is a happy boy smile. Happy birthday to your handsome little man! That road cake turned out GREAT! Pierce looks happy too. Happy Birthday to him. It's adorable! It makes me think of one of the rugs with the roads on it everyone had in the 90's. That cake looks almost too good to eat. Which if you knew about my love affair with cake says a lot. I love, love, love the fun cake, you are so inventive! But I love Pierce even more! He is just so cute anyway, then when you add the lost teeth!! He looks SO happy with his cake! Wish I could come over there and play with him. Anne and Ella are both 7, too! What a great cake!! Happy birthday pierce!! Happy Birthday Pierce! :) Love that cake. LISA, YOU HAVE BEAUTIFUL, GORGEOUS CHILDREN. PIERCE IS VERY HANDSOME. YOUR TWINS ARE SUPER AWESOME TOO. GIVE A HUG TO YOUR PRETTY BOY, PIERCE FROM ME, and TELL HIM THAT POET STARRY SAYS HAPPY BIRTHDAY, PIERCE!! YOU ARE SO BLESSED, LISA. THANKS FOR POSTING YOUR HEARTFELT COMMENTS IN MY BLOG POSTS!! TELLING YOU SOMETHING, I'VE BEEN GOING THROUGH YOUR OLDER POSTS, and FOUND THEM SO VERY NICE and INTERESTING. YOU SEE I HAVE A BIG HEART FOR ANIMALS and CHILDREN. THEN, I WAS READING ABOUT YOUR LOVING HORSE, PHOENIX's HEALTH ISSUE. WE HAVE CATS AT HOME. SO, WE ARE ALWAYS IN CONTACT WITH VETS. SINCE I AM OVERSEAS, I'LL ASK OUR VETERINARIAN, IF HE KNOWS THE DRUG "DOXYCYCLINE". I'LL CALL HIM LATER, and SEE WHAT HE SAYS. IF THAT KIND OF DRUG IS FOUND IN OUR PLACE, THEN, WE MIGHT MAKE FURTHER ARRANGEMENTS, IF YOU WANT TO. ONE THING I MAY NEED IS YOUR HOME PHONE NUMBER, SO THAT I CAN CALL YOU, and TALK ABOUT YOUR HORSE HEALTH ISSUE, and IF WE COULD BE OF ANY HELP. MY HUBBY IS A PHYSICIAN SURGEON OVERSEAS (IN THE AMAZON RAINFOREST AREA). I AM PRAYING FOR YOUR HORSE TO FIND THE SOLUTION. YOU CAN LEAVE A COMMENT IN MY BLOG POST ABOUT THIS. I WILL NOT PUBLISH IT, IF IT IS A PRIVATE MATTER. I'LL KEEP IT FOR ME. SO, YOU CAN DO THE SAME WITH THIS MESSAGE FROM ME. KEEP IT FOR YOUR PRIVACY, and DON'T PUBLISH IT. I CAN SEND YOU AN EMAIL, IF YOU WANT TO CONTACT ME, LISA. I AM AN ANIMAL LOVER & ADVOCATE. GOD MAY BLESS YOU ALL, LISA! Happy birthday to your little cub! That is a cake my own little guy would love -- looks great! happy birthday, dear 7 yr old! 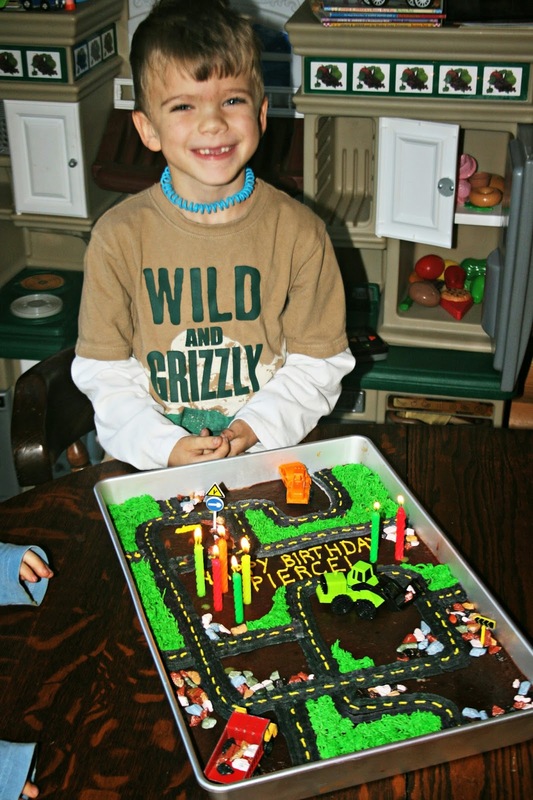 Happy #7 Pierce! They sure do grow up fast! What a wonderful birthday cake. I love how it turned out. I bet Pierce was thrilled with it. You're such a great mom. That's awesome cake! Happy Birthday Pierce. Your Mom did a great job on the cake. Awww, I'm late to the party but a big Happy Birthday to that sweet, sweet Pierce. He is so adorable; I always love that smile. The cake is fabulous, you creative person, you! VERY cool! I'll bet he remembers that cake long into adulthood. It's that sort of stuff that sticks with kids. Happy Birthday, Pierce! 7 is a GREAT age to be! Happy Birthday, Pierce! Such a sweet, snaggle-toothed smile. :-) That is an awesome cake--I love all the details. And bet it tastes delicious! 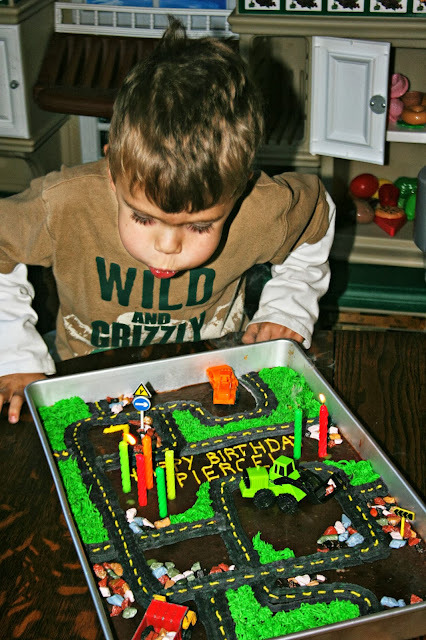 Happy 7th birthday, Pierce! The cake turned out great - awesome job! This is really well done! I love it. YOU Certainly know how to dish up the JOY!!! Color me impressed with all the great stuff you do. Happy birthday Pierce! My son will love that cake too. You did an AWESOME job, baby Girl! I can hardly believe the little boy who called me "old" turned seven! ...:)JP ...Happy Birthday from us! The coolest cake ever! You are such a great mom. Happy belated to Pierce! Great cake for a great kid! Happy, happy birthday!! The cake is so unique and pretty. Since he loves roads maybe he'll be a race car driver one day. Happy Birthday to Pierce and I love the cake....really cute!